As the reports of Russia's involvement in the victory of Erdogan emerged, the Turkish president offered a different version. 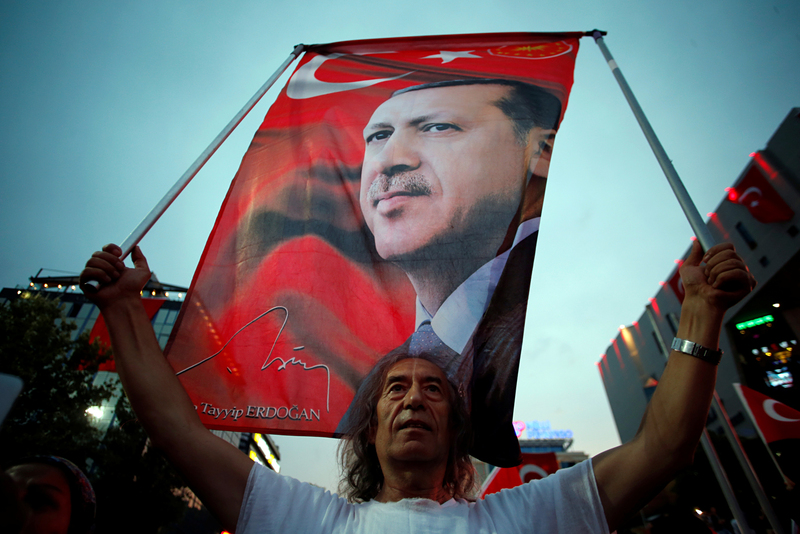 Photo: A supporter holds a flag depicting Turkish President during a pro-government demonstration in Ankara, July 20, 2016. Reports that Russian intelligence warned the Turkish president about the military coup, allowing him to escape and retain power, appeared in various Russian media outlets in the evening of July 20. However, it is unclear to what extent the reports are true: Erdogan himself said that he learned about the coup from his brother-in-law. Russian media have reported that Turkish President Recep Tayyip Erdogan was warned by Russian intelligence services about the military coup against him that was thwarted in the early hours of July 16. The Russian media outlets that have spread the version of Moscow’s involvement in Erdogan’s victory over the plotters cite the major Iranian news agency Fars, which, in turn, refers to reports by several Arab media outlets (in particular, the Sudanese newspapers Al Sudan Al Youm). The Arab media outlets cite anonymous Turkish diplomats as their source. According to the version that appeared in the Iranian media, Russia's military intelligence based at Khmeymim airbase in Syria managed to intercept and decode sensitive Turkish military radio messages. The conspirators planned to dispatch several helicopters to Erdogan's hotel in Marmaris to capture or kill the president. The Russian Defense Ministry allegedly transferred the information about their plans to the Turkish MIT intelligence agency, which allowed Erdogan to escape on time, and then take the initiative. Almost at the same time as the reports of Russia's involvement in the victory of Erdogan emerged, the Turkish president himself offered a different version in an interview with the Qatari TV channel Al Jazeera. According to Erdogan, he was first told about the preparations for the coup by his brother-in-law. At first he did not believe this information, but decided to take action after a conversation with the head of the MIT. Together with his family, he left Marmaris on a helicopter and headed to Istanbul. Turkey coup: Why did the military try to overthrow Erdogan? Earlier, the press service of the Turkish armed forces reported that the MIT intelligence agency did learn about the impending military coup in advance: at 16:00 on July 15 (about five hours ahead of the coup). The sources of the information have not been reported. The Turkish authorities did not comment on the possibility of Russia's involvement in thwarting the coup. The spokesman for the Russian president, Dmitry Peskov, said he had no information about Russian intelligence's involvement in warning Erdogan about the attempt. According to Turkologist Viktor Nadein-Rayevsky, a senior researcher of the Institute of World Economy and International Relations at the Russian Academy of Sciences, it is now impossible to find out whether Russia helped Erdogan. "You understand, the intelligence will not say anything, and no one can confirm or deny the transfer of information," Nadein-Rayevsky told RBTH. Regardless whether the rumors circulating in the media are true, according to Nadein-Rayevsky, their very appearance is an important signal about the improvement of Russia-Turkey bilateral relations. "There is a political game going on, and it is possible that this report is also part of the game," he said. "The spread of these rumors is a good step to demonstrate improved relations, show that there is already serious cooperation." According to Nadein-Rayevsky, Erdogan now needs to improve relations with Russia, and the Turkish president is doing his best to that end. "Erdogan has already said that the activities of the two pilots who shot down a Russian aircraft [the Su-24 bomber over Syria on Nov. 24, 2015] is being investigated," he said. "This is a demonstrative step. Now Erdogan has found himself in isolation from the West and he needs to cooperate with Russia."